Yep I actually finished another book! Computer died completely which left me some spare time. Imagine what I could do if I never got on the computer again. But all my friends are on the computer so that would be sad. On to the book. 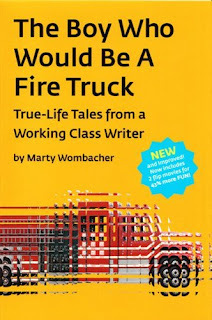 The Boy Who Would Be a Fire Truck - True-Life Tales From a Working Class Writer by Marty Wombacher. I met Marty online on a website we both frequent. Shortly after I started to read his daily blog, A guy walks into 365 bars, (which is almost finished) his friend Gidget put up a chapter of the book on her blog. Its amazing this circle of interwebs. I'll admit that one of the things I loved about his description of the start of summer in the 60's was that it reminded me a lot of the movie A Walk on the Moon, which is one of my all time favorites. I loved the chapter and really wanted to read the whole book. And six months later, I now have. 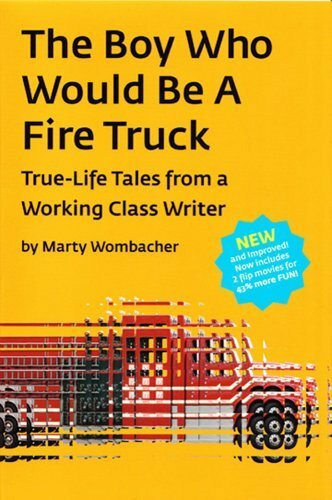 At four years old Marty told his mom he wanted to be a fire truck when he grew up. She told him that people don't grow up to be fire trucks, they grow up to be adults. Marty didn't like the idea of that and decided that he in no way needed to grow up to be an adult. The book is a series of essays from Marty's life. As an online review said "Wombacher's life is unique in the fact that he's had small doses of fame, but he is not famous." Reading the book I actually felt like, wow I've never really had anything exciting happen to me. Not in a dis on my life kinda way, but lets just say Marty and I have had very different lives. And yet there were still things that made me stop and re-read them because they struck a chord with me. After flying to NY to be interviewed by Jane Pauley on The Today Show he said "That was my first time in New York and while we didn't have time to do much sightseeing, I remember feeling like I fit in. Something I never really felt in Peoria." I could have written that same line after my trip to London. Felt exactly the same way just walking around the city, like I fit in in a way I never had felt before. Sometimes life is less about what's different between us, and more about those things that bond us together into little groups. The book has great stories of living in New York, being a writer, the jobs that paid the bills while being a writer, and a very real bond between a brother who passed away. In the end the book made me smile, and I can't think of a better thing to say about it. Marty, if I ever get back to NY (which is a possibility since I DO have family in Brooklyn), I'll meet you at the Stoned Crow with my copy of the book to be signed. This month has been a hard one. I seem to be surrounded by people suffering and dealing with loss. I can't say I'm really in the Christmas spirit this year. Not having Will here tonight doesn't help with that. Another loss today and my heart feels more sorrow than joy. But it does make you appreciate what you have. What you love. And I guess maybe that is part of the spirit. So tonight I wish that you all are surrounded by those you love. And if you can't be surrounded, I hope they are in your heart and that you are able to feel their love. Merry Christmas. To my little army bug and all of you. My home computer is dead. And I woke up with a case of the I don't cares. So we will return to regular programming next week. Hopefully. Thanks to my little foot incident, I have become my parents. Things happen in life that just don't make sense. Life seems unfair. Cruel. And there just isn't an answer for why or how. Yet times like that make you cling to things that you do understand. Things that bring you comfort and peace. And maybe that is the beauty that can be found in those moments. A co-workers wife was killed in a car accident yesterday. They have two kids. We weren't especially close but from those who were I've heard stories about how their marriage was the kind of thing that you wish for. They adored each other and were each others life. Its just a horribly sad and tragic situation. And there isn't anything that you can really do to make it better. It makes me wish that I was closer to him. That I could just show up on his doorstep and offer to help. As much as I have issues with the LDS church, they do know how to step in during a time of need. I know he will have physical help. And the only thing I can really do is continue to be his friend and have a willing ear if needed. So instead you start to think of your life. I think its natural to turn it inward. And it makes you appreciate the things you do have, just a little bit more. And maybe makes you want to make sure you don't take them for granted. Feeling love is something that has never been hard for me. The word doesn't scare me in the least. I believe fully in the Four Loves and that it is something you can feel for everyone. And although its very easy for me to feel, its not always as easy to say. So I want to make sure those in my life know how much I love them. All of them. All of you. Whether its my beautiful son or supportive family. My co-workers who get me through the day. My friends that are there when I need to vent or the friends that are there just to share a common bond. Being able to feel love and share love is what helps fill up your emotional bank to help get you through those times when the world just doesn't seem to make sense. When you don't know what else to feel, you can feel love. And I just wish I could wrap you all up in a giant hug of love. Because the flash scared him and he ran off. Very sensitive soul.